Americade is the world's largest motorcycle touring rally and convention offering the most factory demo teams at any event in the nation. It doesn't matter what your ride is ~ a Harley, an Indian, a Victory, a BMW, a Honda or maybe a Ducati. Are you on 2 wheels or 3 ~ come join the fun and enjoy the breathtaking scenery of Lake George, the Queen of the American Lakes, and the Adirondacks of upstate New York. A true rider's rally this is the beginning of the riding season and offers scenic rides through historic communities ~ Vice President Roosevelt learned of President McKinley at the North Creek Depot, the French and Indian War took place here as well as the American Revolution. Americade is a historic week in a historic part of the world. Tour Expo takes place at the Festival Commons at Charles R Wood Park on West Brook Road. 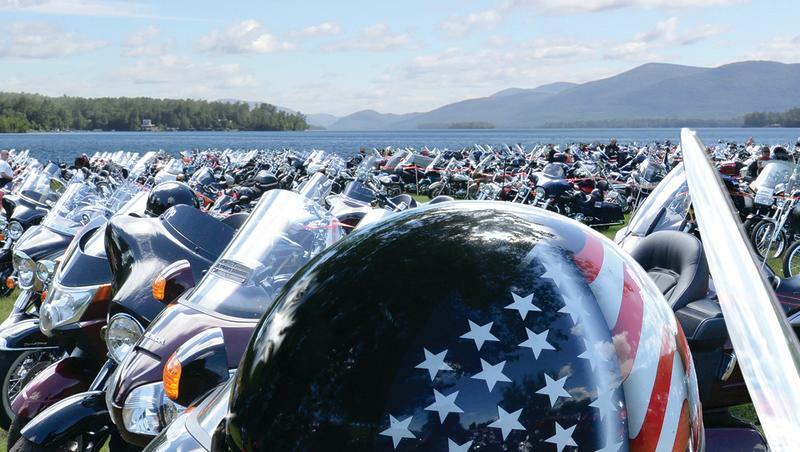 Americade week features guided and self-guided rides; the Block Party and concerts, enjoy dinner boat cruises on the "Queen of the American Lakes". Become a "Roads Scholar" through Americade University, a seminar and lecture series presented by some of the most well-known people in the motorcycling world. Be amazed by the great stunt shows; BBQ, dinners, parties, loads of fun and don't forget the parades! While you're here don't forget to check out the DirtDaze Adventure Bike Rally.